Welcome to the continuing mqers, and a special greeting to the new faces. This thread serves as a general discussion thread for MQ students. Please keep all the miscellaneous and off-topic conversation here as well as comments/queries/observations that don't warrant a new thread. While posts that would generally be considered spam elsewhere are tolerated in this thread, please note that this is not a substitute for Non-School. I wish you success in your studies. I finally figured out how to enrol for Enrolment day and Academic Orientation, and i've booked in for both of those. However it says that I should come prepared with flexible times for my units incase I can't get the time I want. Where do I find what times my units are operating? Is it this thing here: http://i.imgur.com/GtIZp.png ? I have no clue on what i'm doing. Yep thats it your on the right page. So for semester 1 you should be looking at session 1, and semester 2 is session 2. Click on the unit to find out which tutorial and lecture time would suit you, so you can atleast have a rough idea prior to enrolment as to what unit you would like to enrol in. The actual enrolment into the classes is done by a student advisor at the uni the first time you go so you understand the process for future enrolments. Thanks for that. So is Semester 1 just the '100 level' units? Well 100 level units just mean these units are first year units. so they have no real correlation with what semester you do them in. But since your a first yr you will be doing 100 level units to start off with yes. Ok now it's starting to make sense. 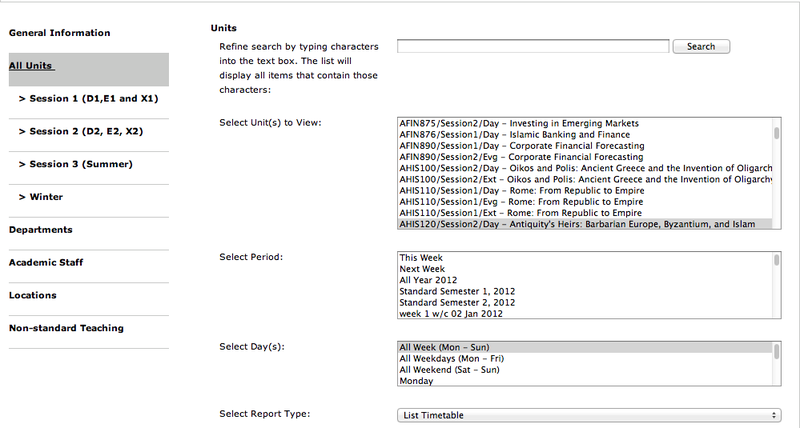 I guess i'm in no rush to create a timetable since enrolment isn't until the 10th. I'm going to get some sleep and try to sort this out tomorrow. Last edited by -may-cat-; 19 Jan 2012 at 9:22 AM. How many years have you got left for your degree? my 4th yr this yr, feel like im getting old seeing all these first years talking about enrollment and offers. Gillet has the best hair of any lecturer. Ever. It has a certain He-Man quality to it. I'm actually looking forward to Antiquities' Heirs. Besides Egyptology, the rise of Christianity and Islam and the transition to our modern world, is something I'm pretty interested in. Also I hear it looks at Persia for a bit. So it would be a good idea to take the subject in semester 1, then? What, AHIS110 or AHIS120? AHIS120 only runs in semester 2 and while AHIS110 (which does run in semester 1) is an awesome unit, i wouldn't take it unless you have an interest in Rome. AHIS120, I'm not interested in Rome. How do i determine what subjects run in which semester? If you look up AHIS120 in the handbook you can see that next to 'when offered' it says 'D2 - Day; Offered in Session 2, North Ryde '. Session 2 here means semester 2. Since not everything is available all the time it's important to pay attention to the hand book to make sure you're structuring your degree properly. Hi, can you guys please help me out? Try reapplying in the late round. You should hopefully get a spot, given your ATAR. The uni can't really do anything, however transferring between campuses is pretty much automatic and you can do so after one semester (worst case scenario). Say if a person was doing a B of Arts and one of their majors was international business. After some time, they successfully transfer to B of Commerce - a degree which also has a international business major. Is it the same? Do the credits from completing international business in B of Arts carry over to B of Commerce? Umm, I told Riproot and effy to get a room. In a Scottish accent. The best way to find an answer to that question is to compare the subjects you study in each major. You can find this in the "What you will study" tab of each major, under the respective degrees. If the subjects are the same, then yes, you should receive credit for them when you transfer. Frolicking in the lands which are supposedly merry. B Commerce - Int business. I am doing this, and it is absolutely horrible and soul crushing. Do marketing instead, much better. Some of the subjects are different, would that mean it is not possible to get the credit transfer? Or would they 'overlook' it seeing the near whole of the Majors are the exact same? I noticed that differences in the same Major subjects are exactly like the example above. I thought you were going to say that it would make me uncomfortable due to me 'learning' about chinese and japanese business and whatnot. Need I remind you - I am not a racist, and do not live in some gated off whites only community far from non whites. Going to MacQ should give you a rough idea of where I live and my choices, seeing as though I've lived in the area my entire life it should obviously reveal to you that I have been deeply emerged in multiculturalism my entire life. What majors did you guys do? What ones are the most enjoyable and practical once graduated? I major in accounting, which is quite enjoyable, gets really practical and interesting as you go along the degree. I think finance is also quite a good major, along with marketing, but accounting isnt as bad as people make it out to be, once you do 2nd and 3rd yr accounting you realise how enjoyable it can be, and how many doors it can open up career wise. hey guys, can you please help me out? I just got accepted into Bachelor Commerce/Bachelor of Laws in Macquarie. I want to start my timetable, but am confused. Do I first need to do those courses 100 level since I'm only first year? And when do I have to get my timetable done by? I'm so confused I read the handbook from Macq and watched all the Vodcasts related to enrolling/timetables but I'm still confused. Will I be too late? Will all the spots be taken?